The work being carried out in our laboratory is aimed at understanding several aspects of the circadian system of plants. The circadian (~ 24 hour) system has a central role in regulating the timing and co-ordination of photosynthesis – the clock controls photosynthesis and photosynthetic products feedback to affect the circadian oscillator that generates rhythms. 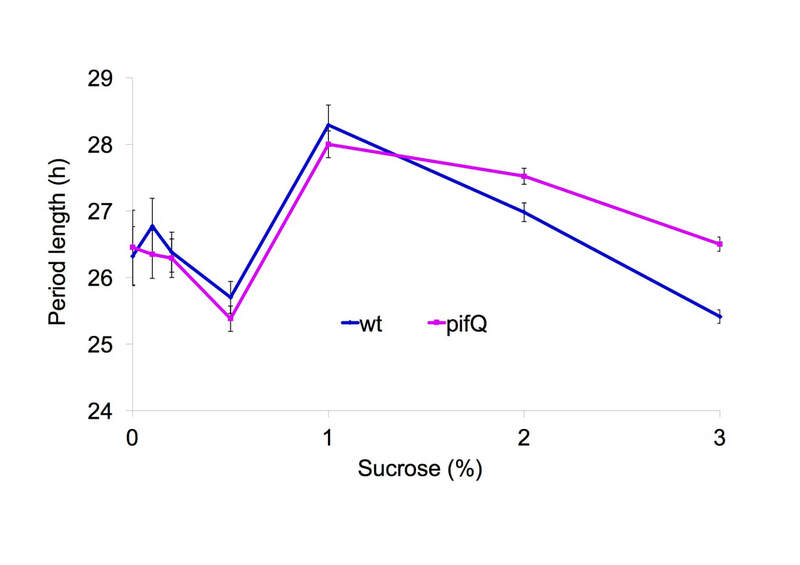 In collaboration with Prof. Enamul Huq (University of Texas, Austin) we have shown that PHYTOCHROME INTERACTING FACTORs (PIFs) mediate metabolic signals to the circadian oscillator in and that sucrose directly affects PIF binding to the promoters of key circadian oscillator genes in vivo to entrain the oscillator. Our current focus is on exploring how PIFs act as hubs in entrainment pathways to the oscillator in Arabidopsis. 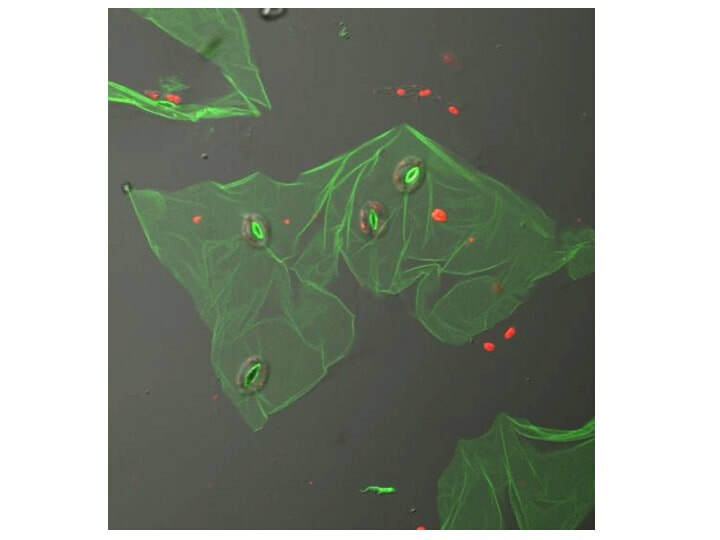 Stomata allow gas exchange between the interior of the plant and its environment. Opening and closing of the stomata is driven by changes in the turgor pressure of the guard cells and is regulated by the circadian system. We have developed techniques that allow us to study circadian rhythms in individual cells and shown that Arabidopsis stomatal guard cells have circadian systems that are significantly different from those of the surrounding leaf cells. We are currently exploring the mechanisms and significance of the unique stomatal guard cell circadian clock. It has been suggested that having an endogenous circadian system enables an organism to anticipate periodic environmental changes and adapt its physiological and developmental states accordingly, thus conferring a fitness advantage. However there is, to date, only limited evidence supporting the assumption that having a circadian system can increase fitness and therefore be adaptive. We are using an evolutionary approach to examine the adaptive significance of a functional circadian system. By crossing Arabidopsis plants containing mutations that cause changes in circadian rhythms, we have created a population of plants with genetic variance for circadian rhythmicity. We showed that plants with endogenous rhythms that more closely match the environmental T-cycle are fitter, producing relatively more viable offspring in the F3 population. Thus, having a circadian clock that matches with the environment is adaptive in Arabidopsis. Although most of our work is carried out using the model plant, Arabidopsis, we are also interested in understanding the circadian system in food crops. In a collaboration with Dr. Seth Davis and Dr Maria Von Korff (Max Planck Institute for Plant Breeding Research, Cologne), Dr. Munqez Shtaya (An-Najah University, Nablus), Dr. Eyal Fridman (Vulcani Institute) and Dr. Moshe Kiflaw (Ben Gurion University) we have shown that there is variability for circadian traits in wild barley lines. We have analyzed circadian rhythms in populations of wild barley from a widely different eco-geographical locations in the Southern Levant part of the Fertile Crescent, an area with a high proportion of the total genetic variation of wild barley. We observed that circadian period lengths were correlated with temperature and aspect at the sites of origin of the plants while the amplitudes of the rhythms were correlated with soil composition. Thus different environmental parameters may exert selection on circadian rhythms.